Posted November 22, 2016, in News. On Thursday, November 17th, WRI Senior Project Administrator, Tracy Swan, presented at the 72nd Annual Meeting of the American Society of Criminology. Ms. Swan presented two posters on preventing juvenile delinquency in Cumberland County, New Jersey. Her first poster, Plugging the School to Prison Pipeline, addressed school personnel’s growing reliance on law enforcement for managing classroom behavior and possibilities for reversing the trend. The second poster, Stationhouse Adjustment: Keeping Youth Out of the Juvenile Justice System, detailed the diversion effort’s success in reducing recidivism in low-level offending youth. Both presentations were based upon analysis generated from the facilitation of the Cumberland County Positive Youth Development Coalition (CCPYDC), an effort funded by the New Jersey Office of the Attorney General and Cumberland County Freeholders. 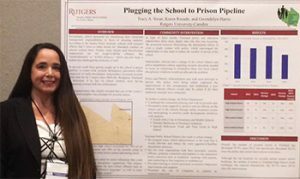 In the Plugging the School to Prison Pipeline presentation, Ms. Swan examined how teachers and principals in the 9th – 12th grade schools of Vineland, New Jersey relied heavily on local police to manage and maintain student behavior. During 2012, these schools had the highest rates for juvenile arrests in the county (10% of all juvenile arrests), representing 20% of juvenile arrests in Vineland itself. Charges ranged from non-violent offenses such as improper behavior and offensive language, to more serious offenses such as simple assault. Through facilitation and technical assistance provided by WRI, CCPYDC stakeholders resolved to change the school district and police department’s culture regarding juvenile discipline, as continuing to criminalize low-level violations would exacerbate the problem. Through a wide array of collaborative programming and policy changes, juvenile arrests in the schools declined significantly, down 45.1% between 2013 and 2015. Ms. Swan’s presentation of Stationhouse Adjustment: Keeping Youth Out of the Juvenile Justice System reflected on how CCPYDC redesigned Stationhouse Adjustment in its three urban centers to prevent more youth from reoffending and becoming further entrenched in the juvenile justice system. In New Jersey, Stationhouse Adjustment (SHA) is an alternative method for police to handle first-time juvenile offenders with minor offenses. SHA provides immediate consequences, such as community service or restitution, while allowing youth to avoid a formal juvenile delinquency record. Working with the County Prosecutor, SHA in Cumberland allows additional offenses beyond those listed by the Attorney General’s directive, even up to second or third arrests. Most important to the success of the program, however, is the use of Chaplains in the administration of SHAs. Chaplains are trained to administer and manage the SHA program, saving police hundreds of hours in personnel time. They provide the skills and expertise necessary in working with youth and their families, addressing root cause(s) of delinquency. Chaplains are on call 24/7 and commit to meeting youth within 30-45 minutes of arrest. Youth and Chaplains work together to form plans of action that outline the consequences of crimes committed, steps needed to resolve underlying issues contributing to delinquency, and ways to give back to their community through service. WRI’s evaluation of Cumberland County’s SHAs reflected a 122% increase in use from 2013 to 2015, alongside a 41% decrease in juvenile arrests. A review of police contacts determined youth who completed a SHA in 2015 had the following rates of recidivisms: 9.7% over 3.1 months (Curbside Adjustment) and 12.9% over 2.7 months (juvenile arrest). Page last updated by Senator Walter Rand Institute for Public Affairs at 10:41 am November 29, 2016 . This page was printed from http://rand.camden.rutgers.edu/2016/11/22/ascc2016/ at 5:03 PM Monday, April 22, 2019.